I refuse to pay mall prices for soft pretzels. It actually would kill me to spend $3.00 for a delicious mall-made pretzel, when I can spend less than that on making 16 of them at home. Sure, it's a lot more work, and I end up with too many pretzels, but my family and friends help me make and eat them, and I can also make some yummy pretzel dogs while I'm at it. Then I can call it a meal. This recipe comes from Allrecipes.com (http://allrecipes.com/Recipe/Mall-Pretzels/Detail.aspx), and the recipe is titled "Mall Pretzels." I think they're referring to the Auntie Anne's variety. I can't say, since I refuse to buy them. 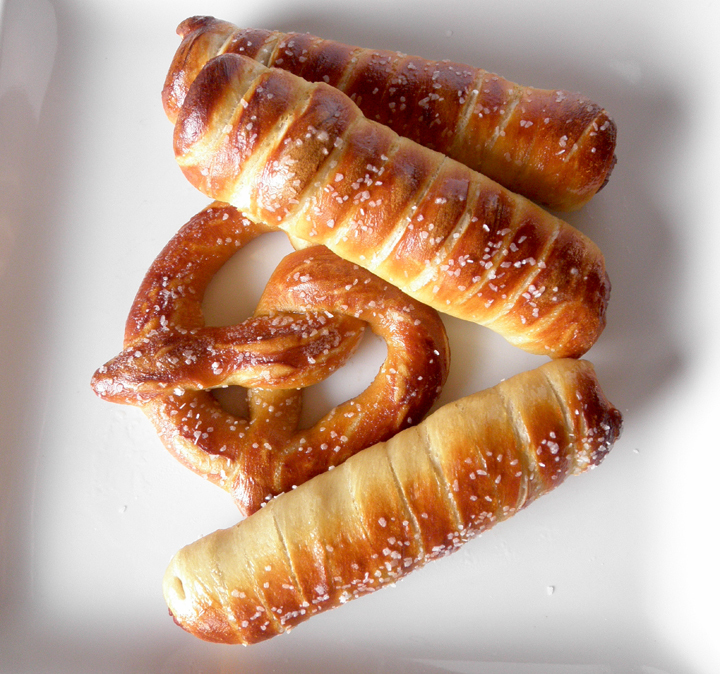 These are great pretzels, though. They turn out chewy, buttery, salty, and a deep dark pretzely color. 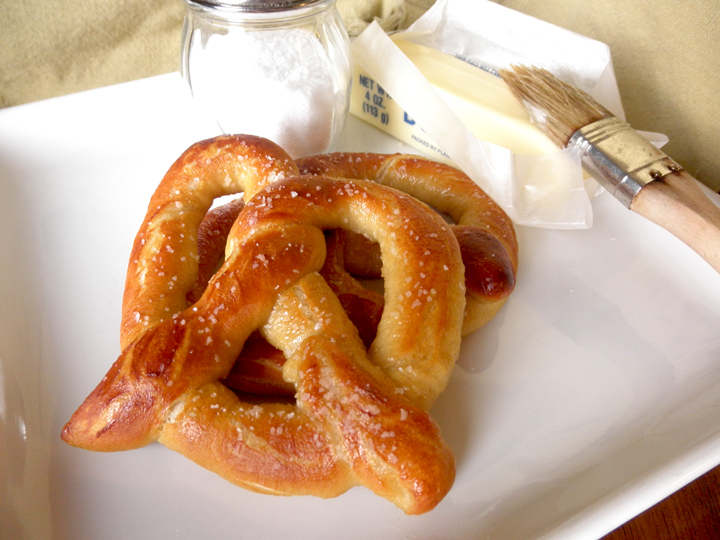 The water & baking soda bath is the key on the pretzel color and flavor. Make sure you use the parchment paper. If you've never used parchment paper, it's about time you did. Trust me, it's one of my best tools in the kitchen. 1. In a large mixing bowl, dissolve the yeast, brown sugar and salt in 1 1/2 cups warm water. Stir in flour, and knead dough on a floured surface until smooth and elastic, about 8 minutes. Place in a greased bowl, and turn to coat the surface. Cover, and let rise for one hour. 2. In a large, low-rimmed saucepan, bring water and baking soda to a simmer over medium heat. 3.After dough has risen, cut into 16 pieces. Roll each piece into a 3 foot rope, pencil thin or thinner. (If the dough resists lengthening. Set down and let rest for about 5 minutes.) 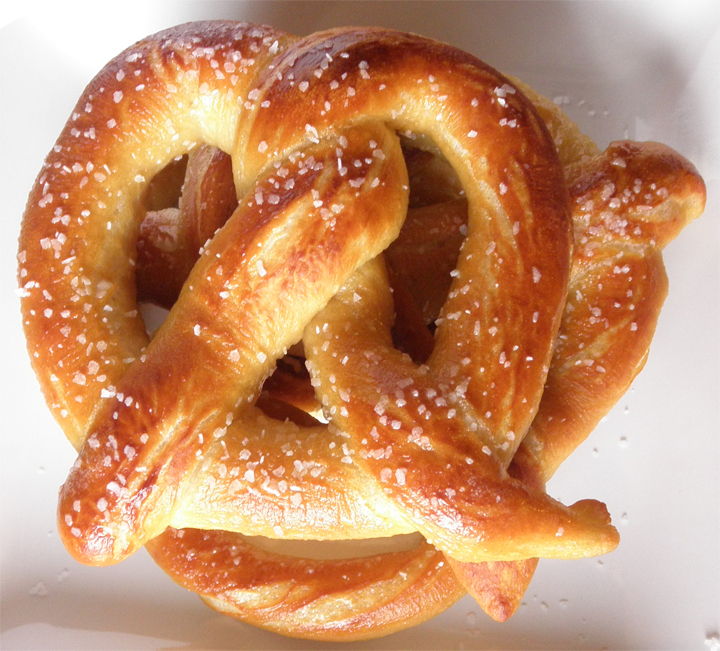 Twist into a pretzel shape*, and dip into the baking soda solution for about 20-30 seconds. Place on parchment covered cookie sheets, and let rise 15 to 20 minutes. *If you want pretzel dogs, take a hot dog and a dough rope and press one end of the dough rope into the side of the hot dog at one end. Wrap rope around the hot dog until there is no more rope and then pinch to seal at the end of the hot dog. Dip into water/soda solution as you did the regular pretzels. 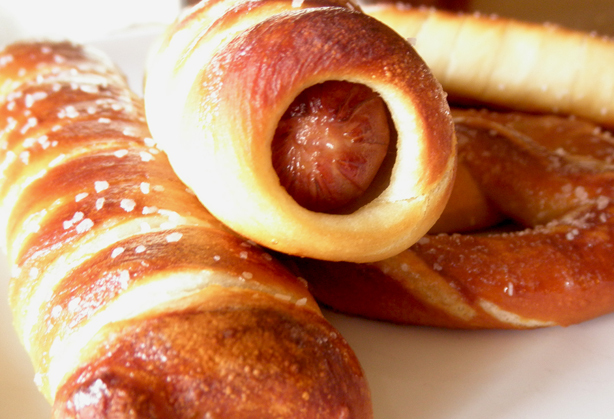 If you’re doing both regular pretzels and pretzel dogs, do the regular pretzels first so they don’t end up tasting like hot dogs from the water/soda bath. 4.Bake at 450 degrees F (230 degrees C) for 8 to 10 minutes, or until golden brown. Brush with melted butter, and sprinkle with coarse salt, garlic salt or cinnamon sugar. They turned out very, very yummy; just like the kind you buy at ball games, etc. I used bread flour and brushed on egg yolk before baking instead of butter. They cooked up perfectly and came right off the parchment paper no problem. My batch took about 11-12 minutes for a nice golden brown. The kids are gonna love this for an after school snack! I have a question, can you freeze them after they are cooked if you can't eat them all?? I am making them right now...they are taking their little snooze before I dunk them and then twist them. I have frozen some of the pretzels, and then I've tried reheating them in the oven. Unfortunately, both times I reheated them, I forgot and they got a bit crisp. If I'd had my head about me, I think they would have been fine. I have yet to try freezing and reheating the pretzel dogs, though. These look beautiful, just perfect! You've got me all excited to try these out. Yummy! Hi! I wanted to say I froze the hotdogs and reheated them in the microwave in a container with the lid vented so to keep some of the moisture. It took 1 minute to reheat them individually and I thought they tasted just as good! Awesome recipe by the way! Excellent, Catie! Thanks for letting me know! About how many hot dogs will this do? That's a great question. I guess I didn't put the yield at the end of this recipe. I guess it will make about a dozen. I've never used it all for pretzel dogs. I always do a mixture, and I haven't done it in a while. I think I usually make about 6 pretzel dogs and 6 regular pretzels.